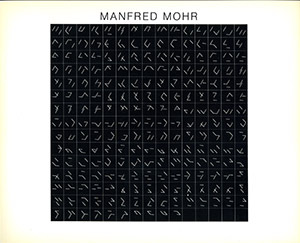 The catalogs often introduced a new art workphase of Manfred Mohr. Each was associated with one or two exhibitions. In May 2011, we created on emohr.com a webpage commemorating the 40th anniversary of the historic exhibition "Manfred Mohr - Computer Graphics - Une Esthétique Programmé" - ARC Musée d'Art Moderne de la Ville de Paris - 11. May - 6. June 1971". This webpage contained a PDF of the workphase catalog, 1971, associated with the show as well as archival material including photos, press, invitiatons, and posters. There has been a very positive response to this webpage. 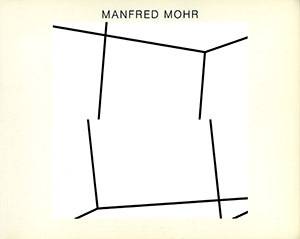 Thus we are providing on this webpage more PDFs of Manfred Mohr's early catalogs and some of the archival material from their associated exhibitions. Note that not all workphases were associated with a one-person catalog. We will later include documentation from these workphases also. All artwork starting in 1969 is generated with self-written computer algorithms. - some algorithmic ideas included: linear transformations to form surfaces, adding and subtracting lines, curve fitting, shifts to create fuzzyness. 1968: Manfred Mohr "signes géométrigue"
This is Manfred Mohr's first workphase catalog. This catalog contains works from 1967-1968. In this workphase from 1966 - 1969, Manfred Mohr created hard edge geometric artworks which he later called 'Surrealistic Geometry'. His elements were influenced by electronic and other technical signs and arranged so that the pictorial construction created a visual tension field. In addition to paintings, drawings, and lithographs, he created wooden reliefs, an interactive kinetic sound machine, multi-part works, works in series, and a visual poetry book. In this period, he had his first and second one-person shows. The events of Mai '68 in Paris influenced his first exhibition. 1971: Manfred Mohr - Computer Graphics "Une Esthétique Programmée"
After having first used the computer at the newly formed University of Paris at Vincennes and having one time access to a light pen plotter at Brookhaven National Laboratory and then to a Zuse flatbed pen plotter at the University of Darmstadt in 1969, Manfred Mohr was given access to the flatbed pen plotter and computer at the Meteorologie National in Paris. He worked enthusiastically nights and weekends experimenting with the new machines. Algorithms/Methods from this workphase: mathematical methods - linear transformations from one form to another, spline functions to create curves, adding (and subtracting) lines to create forms, matrix layout, stretching, shifting to create fuzzy surfaces (vibrations), reflection, negative and positive surfaces, hashed surfaces, overlaying, space defining random walks. Geometric objects - lines of varying thicknesses, curves, circles, squares, cubes. Inventing random electronic circuits, abstract texts, random alphabets, tracing forms with an electronic light pen. 1974: Manfred Mohr "Drawings Dessins Zeichnungen Dibujos"
This is the second Manfred Mohr workphase catalog with computer graphics. This workphase contains works from 1971-1973. In this workphase, as in that of the one before (1971), Manfred Mohr developed a new algorithm for each drawing and explored many different ideas. Algorithms/Methods from this workphase: Series of drawings, partitioning of space, path finding, space filling, reflections, projections on spheres, projections into circles, geometric objects with their lines as the alphabet (squares, triangles), angles corresponding to the alphabet and numbers, complementary lines, spaces and sub-spaces (lines into squares), more spline fits for curves, more hashed surfaces (vertical, horizontal and circular), inversion of images, arcs of circles, non-intersecting objects, squares with moving sides, dividing of objects, rotation, sliced objects. 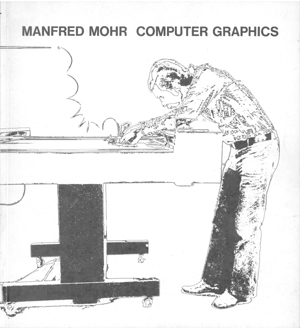 In this workphase, besides the computer generated drawings, he started making computer generated films, some of which were published in the next workphase catalog in 1975. 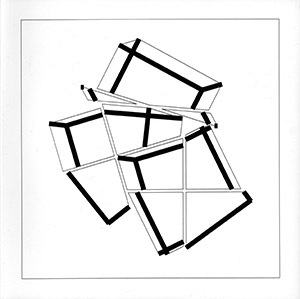 1975: Manfred Mohr "Cubic Limit, Generative Drawings, Part I Travaux de 1973-1975"
This is the first Manfred Mohr workphase catalog using the cube as a fixed structure. He uses the lines of the cube as his alphabet for his drawings. This workphase contains works from 1973-1975. The first hundred copies of this catalog contained a computer generated etching. The graphical elements consist of subsets of the lines of a cube. This is an extension to the cube of his drawings from 1972 where he uses the lines of squares and triangles as the alphabet. Rotation of the cube is introduced here. Algorithms/Methods for this workphase: Series of all combinatorial number of lines n at a time, symbolic logic operations, various clusterings of elements, complementary elements, computer generated visual diagrams explaining the process, use of numbers as well as graphic elements. In this workphase, besides the computer generated drawings and etchings, he created computer generated films. 1977: Manfred Mohr "Cubic Limit, Generative Drawings, Part II Travaux de 1975-1977"
In this workphase Manfred Mohr continues using the 3-D cube as a fixed structure. This workphase contains works from 1975-1977. 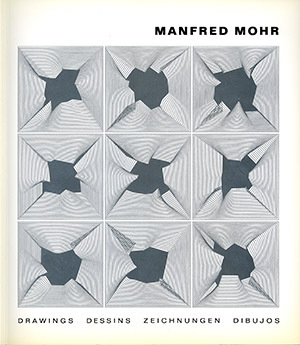 This catalog introduces windowing, clipping, and cutting into Manfred Mohr's work with cubes. The clipping of the cube creates the tension between the independent rotations along the cut-line. The first part of this catalog continues to use the lines of the cube as an alphabet: subsets of the cube are added up to form larger subsets, lines are summed up to create thicker lines, transformations from one cube to another are shown. The next part of the catalog extends the lines of the cube to fixed points along a larger structure and then rotates the cube holding these outside points fixed. The last part of the catalog cuts the cube by its frontal square window (0,0,0 rotation of the cube), seperating the structure into inside and outside lines. The cubes are also cut by horizontal, vertical or planes in the Z direction while showing 2 independent rotations of the cube in each half. Long series of these windowed and cut rotations are shown. The tension of the rotation along the cut-line are made visible in these series. 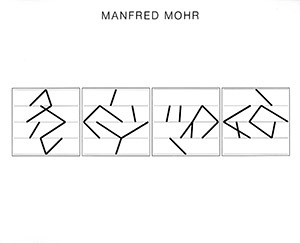 In this period, Manfred Mohr returned to making paintings as well as drawings from his computer generated work. He also made transformations of texts and graphics from one text or object to another, on among other materials sprocketed printer paper. He also wrote some programs for cylindrical, pyramidal and conical anamorphoses projections associated with an exhibition in a museum. 1978: Manfred Mohr "Generative Bilder und Zeichnungen 1977/78"
Same workphase as last part of 1977 catalog, clipping with a window and cuts by cartesian planes, drawings/paintings 1977-1978. 1979: Manfred Mohr "Dimensions, Generative Works, works from 1977 - 1978"
This is the first Manfred Mohr workphase catalog using the n-dimensional cube as a fixed structure. In this workphase, he uses the graph of the 4th dimensional hypercube. This workphase contains work from 1977-1978. In this workphase, Mohr also introduces the diagonal path as an element/alphabet in his work. Algorithms/Methods: paths over structures, sub-structures, division of a structure into parts, recombination of divided structures, magic square as a composition element, combinatorics, numbered paths, path lines are summed to create thicker lines, vertices used as element, computer generated visual diagrams to describe a process, black and gray ink drawings. The work consists of drawings, paintings, series of paintings, and multi-part wooden reliefs. 1980 Manfred Mohr "Werkübersicht von 1965-1980"
Retrospective of work from 1965 - 1980, with work from Mohr's informal, geometric, and computer generated algorithmic workphases. 1981: Manfred Mohr "Divisibility, Generative Works, works from 1980 - 1981, 1981"
In this workphase, Manfred Mohr returns to the 3 dimensional cube. He creates multi-part structures and shaped canvases which use windows and cuts to show the tensions between independent rotations of the cube. He creates surface and line interactions with rotations of the cube. This workphase contains work from 1980-1981. This workphase introduces the 4-cut and out-lines/in-lines (surface/linear signs) paradigm and extends the cuts and windowing of Cubic Limit II (1977). The first part of this catalog shows the 2-cut of Cubic Limit II (1977) with very thick lines which approach surfaces. The next part of this catalog shows a 4-cut, with inside/outside - black/gray lines, which are moved in incremental alternating horizontal and vertical steps into overlapping positions. The last part of this catalog introduces the 4-cut, a cube cut through its origin into 4 parts by the cartesian x and y axes, where 3 of the 4 parts have an independent rotations, and the 4th part matches its opposite rotation, to create a visual balance. The workphase emphasizes the outer form (surface) of the 4-cut as well as the inner lines, thus creating the out-line/in-line paradigm. The horizontal and vertical cut emphasizes the tension between the independent rotations. Surfaces are achieved in the drawings with 2 overlaying pieces of paper each with a different part of the drawing on it. The bottom paper has the out-lines filled in with black ink. The top paper has the in-lines. Thus the 2 overlayed (slightly transparent) papers form the "surface/linear signs" paradigm. Multi-layered drawings, multi-part reliefs, series of multi-part reliefs, matrices of multi-part reliefs are created on canvas and in wood. The out-lines become the shape of each part of the object (surface) and the in-lines are drawn on the canvas of each part. 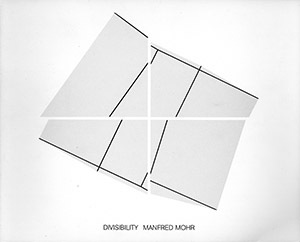 1985: Manfred Mohr "Divisibility II, Generative Arbeiten, works from 1981 - 1984, 1985"
This workphase extends the last workphase Divisibility I 1980, by using the original 4-cut as a generator of an organic-like growth. The out-lines of the last generation of the structure are used to generate the next generation of the structure (with no overlapping parts). Thus a graph-like multi-piece graphic object is formed. This workphase was developed 1981-1984. These objects were first realized on paper and canvas with the out-lines and in-lines drawn. They were eventually realized as shaped canvas and wooden reliefs (as in Divisibility I, 1980), as multi-piece growths with the out-lines as the shape of each part and the in-lines drawn on the canvas of each part. 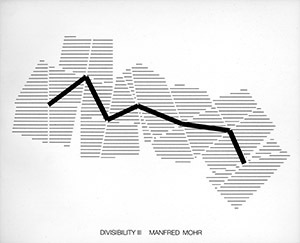 1986: Manfred Mohr "Divisibility III, Generative Works, works from 1985 - 1986, 1986"
This workphase is the complement of the last workphase Divisibility II 1984. It again shows the organic-like growth over the original 4-cut as generator. Here only the out-lines are shown as shapes (the in-lines are not present). The growth is shown as a spine-like broken branching line, each part of which passes through the generating center of the 4-cuts of one generation to the centers of the 4-cuts of the next generation. This workphase was developed 1985-1986. The works are realized as drawings and paintings with hash lines filling the out-lines (surfaces) and as relief structures with the out-line shaped surfaces in gray cardboard and the spine in wood, superimposed on the growth.